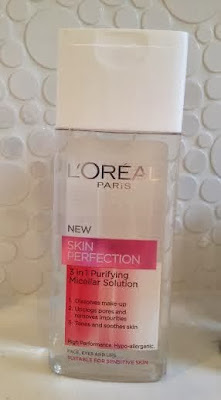 Or to give it its full name L'Oreal Paris Skin Perfection 3 in 1 Purifying Micellar Solution.... just rolls off the tongue no? Anyhow, calling it just Micellar Water is enough for me. Still confused? Well - it is an alcohol-free cleanser for your face that you can also use for your lips and eyes. It is hypo-allergenic, and the blurb claims is is as gentle as water. Basically it is a great make up remover and cleanser. 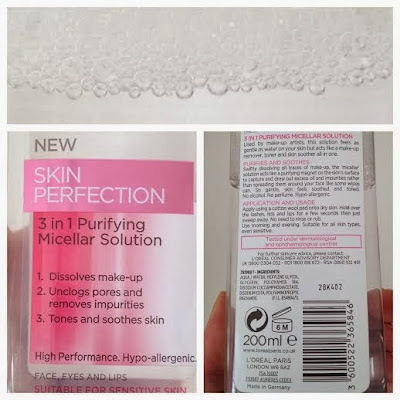 Micellar waters are a new type of make up remover where oil is held in the water but in a way where the two don't separate (so the oil doesn't sit on top of the water). It is therefore a really effective make up remover but doesn't leave an oily feeling on your face. If you soak some cotton wool in the solution you can just hold it over your eye make up and leave it for a few seconds. It actually dissolves even stubborn make up and means you aren't scrubbing away and tugging at the delicate skin around your eyes. It also cleanses and tones at the same time. I must admit before this I used wipes to remove make up but these made my skin sting and I'd end up scrubbing away and smearing eyeliner panda-style around my eyes. The real proof of the inadequacy of the wipes were the mascara smudges on my pillows the next morning. The L'Oreal Micellar Water has been a much better option for me. The L'Oreal Micellar Water comes on the back of the much hyped Bioderma (you can read Viviana Does Make Up's review here). Bioderma is regarded as the supreme Micellar Water, but a far pricier option, not to mention tricky to get hold of. When I first started reading about Bioderma it also seemed impossible to get hold of the UK, but a quick Google hunt shows that you can now buy it through Amazon at £15 for 500ml HERE or the almost too good to be true £4.50 for 100ml HERE. 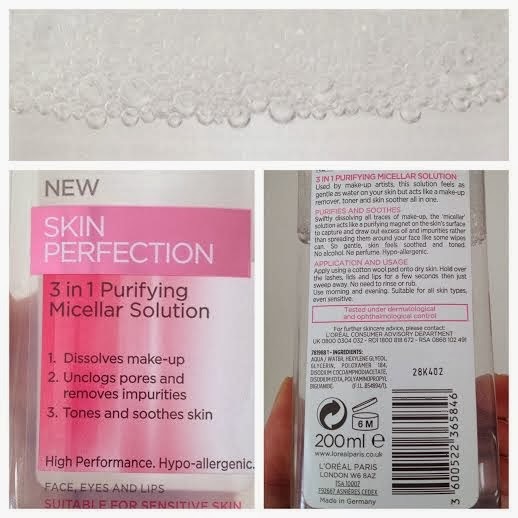 By contrast the L'Oreal Micellar Water is freely available at Boots HERE for £3.33 for 200ml. I'm on my third bottle in 7 or 8 months so the cheaper option certainly works for me (not to mention my clean pillow cases). Have you tried Bioderma? How does it compare to the L'Oreal Micellar Water? I would love to hear your reviews.